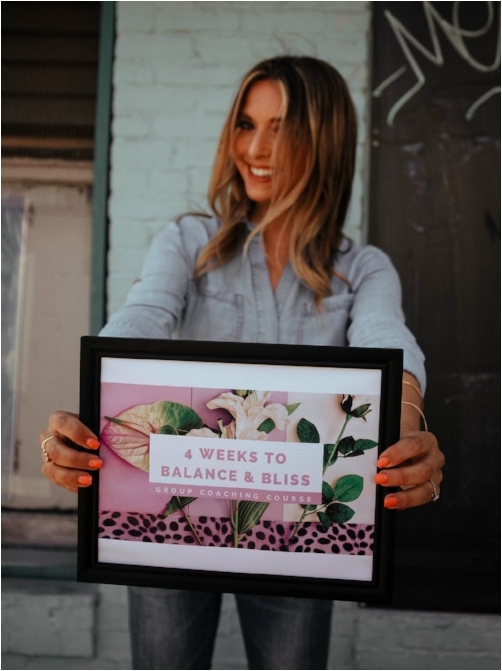 January - "4 Weeks To Balance + Bliss"
Do you make the same new year's resolutions every year? The first few days, weeks and even months are inspiring and exciting but as life kicks in and the motivation wears off, you feel like your resolution becomes something you have to do and the guilt starts to creep in. I HEAR you because I've been YOU…multiple times. And you know what I figured out? A resolution usually requires giving something up or doing something you don’t want to i.e. lose 10lbs by X date, stop drinking coffee, workout one hour every day . But none of that is fun, exciting or motivating longterm and hence, it doesn't last...that's why I've created my new group coaching course 4 Weeks to Balance & Bliss: NEW YEAR, 2.0 YOU! It's not about becoming a NEW you because you are FAB just as you are but it is about stepping into that 2.0 version of yourself....the version of you that is happier, energized and more confident in your own skin! Keep in mind: balance + bliss isn't about being blissful and balanced all the time but about finding the place where you've reached the most real version of yourself without apology! It's about living a life at your highest vibration, making choices that feel best in your body and soul and using the tools and experiences you've picked up along the way to get back to that place when things go a little astray! Life will always have ups and downs but it's about how you move through and past them that makes the most impactful difference! CONTACT: JESS@BODYBLISSBYJESS.COM OR INFO@YOURHORMONEBALANCE.COM FOR MORE INFORMATION!